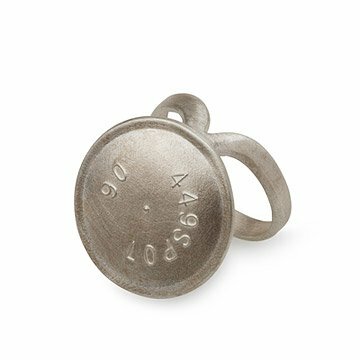 An everyday object gets a fashion-forward makeover with this industrial-chic pop top ring. Inspiration comes in some unlikely places. For Ayesha Mayadas, it was in the dairy aisle. The designer turns discarded milk carton pop-tops into industrial-chic metal rings. A simple silver band lends minimalist style, while the silver disc pendant is sure to cause a second look. Handmade in New Jersey. This design was the first runner up in the JCK Design Challenge. Read more on our blog. Ayesha Mayadas was born in Calcutta, India and moved to Rochester, NY at age 15. After a thirteen year career as a textile engineer, she finally gave in to her passion for metals and decided to dedicate herself to it full-time. Her wearable pieces in silver, gold and platinum pay meticulous attention to line. The character and direction of a line has the power to communicate emotion and states of mind. The quality of a line is equal to an artists’ signature. For Mayadas, this line can be best expressed in her work through techniques of metal forging She has her studio and retail store in Englewood, NJ. All her pieces are designed and crafted on site. She work with assistants, but she is actively designing and making pieces at the jewelers bench.